Rotisserie Chicken Salad — The SECRECT to Chicken Salad Perfection! Because it’s made of ranch dressing + green onions + bacon + cheddar cheese + rotisserie chicken. Need I say more? 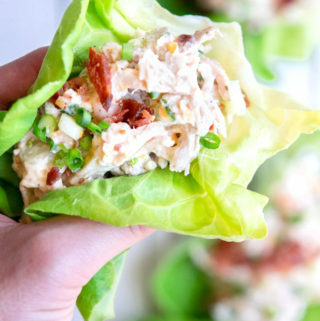 Creamy, crunchy, cheddar-y, bacon-y goodness, mixed into a portable, protein packed low carb lunch. 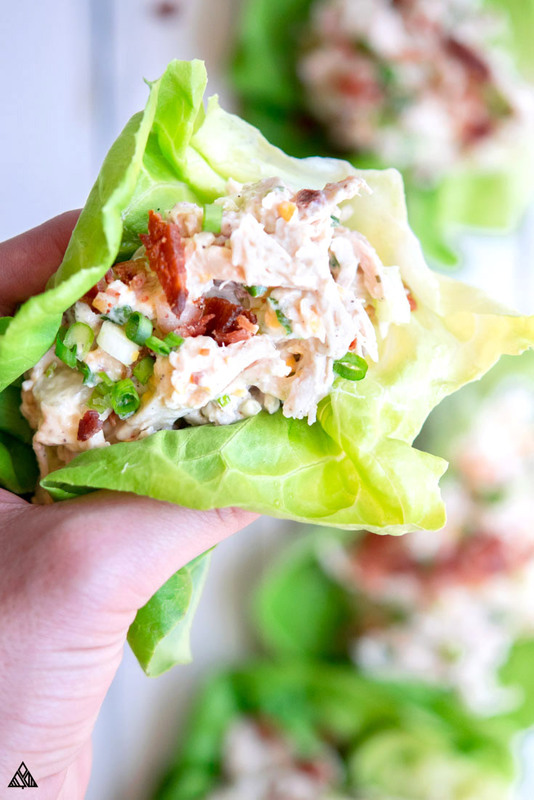 Wrap your rotisserie chicken salad up in lettuce, throw a dallap on some avocados, stuff it inside a hollow tomato — heck even on its own this stuff is irresistable! Perfect for low carb meal prep picnics, even fancy lunch ins! No matter the occasion, I know you’re gonna love this rotisserie chicken salad. So, let’s get mixing friends! 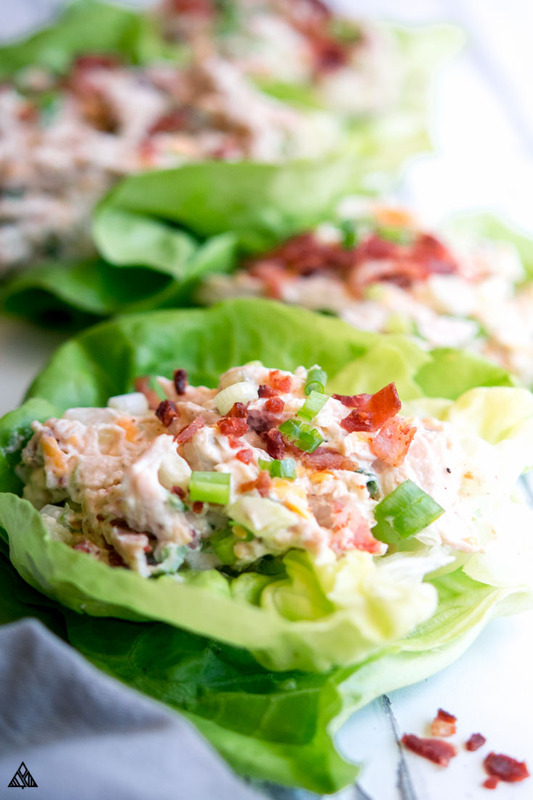 As you know, there are a billion ways to make low carb chicken salad. 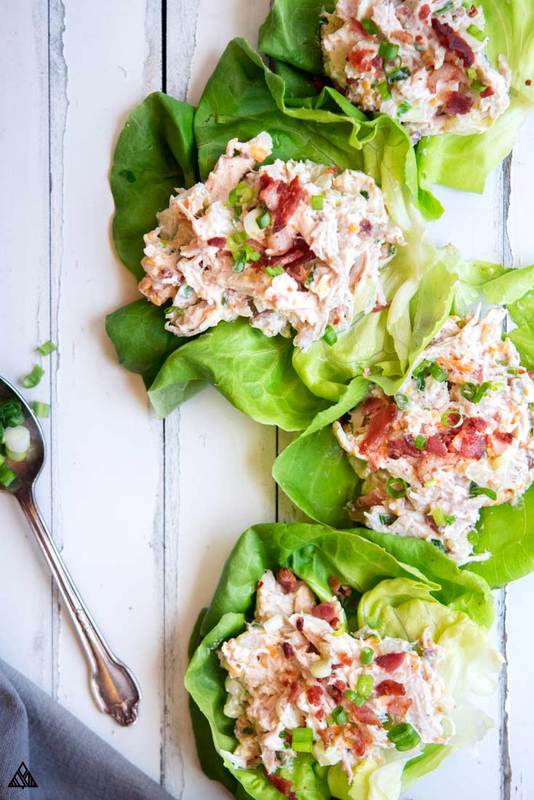 A traditional chicken salad recipes or simple rotisserie chicken salad is made using mayo, celery and onions — all low carb foods, and super delicious, but we’ve been there and we’ve eaten that. So, I decided to fancy up these rotisserie chicken salad ingredients to get it tasting extra delicious. First, there’s the chicken. I chose rotisserie chicken as it’s got a juicy, delicious, flavor, especially compared to alternative cooking methods. I shredded the chicken into bite sized pieces using my hands, leaving off the skin. 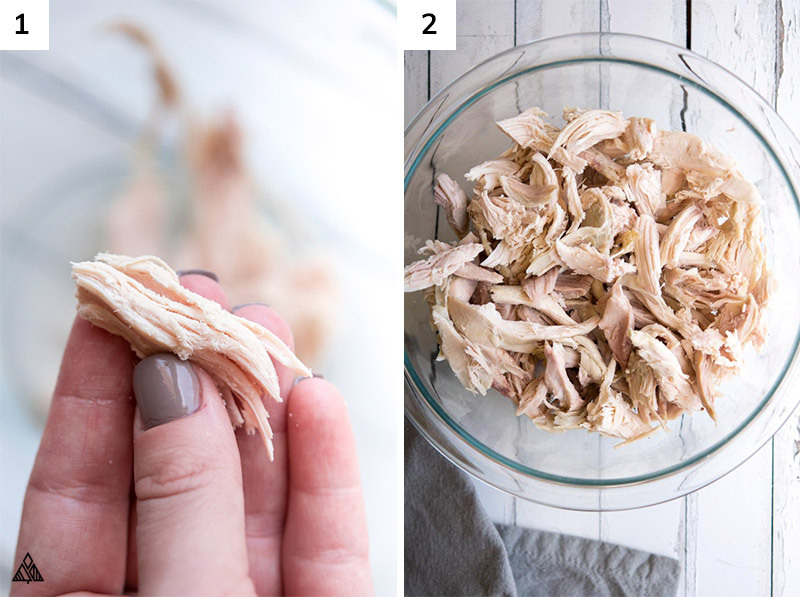 Then I found this hack to quickly shred chicken, how cool??? A basic chicken salad recipe calls for baked or boiled chicken. If you’d prefer this, replace the rotisserie chicken with cooked, shredded/diced chicken. Some stores sell pre cooked chicken to save you some time! This recipe can easily be turned into a canned chicken salad recipe by swapping the ingredient and using the same measurements. If you use canned chicken, be sure to drain any liquid before adding it it! Try curried chicken salad if you’re looking for a funky take on this traditional dish. It utilizes a handful of different veggies and spices, that are hard not to love! Then there’s the creamy, saucy part of any rotisserie chicken salad recipe. Mayo is the most common ingredient used, which just so happens to be a low carb shopping list item. In this recipe I used a combination of low carb Greek yogurt and keto ranch dressing. Because they’re both low carb and they’re both amazingly delicious! Ranch is a delicious, creamy, flavor packed ingredient that works wonders as a sauce in this rotisserie chicken salad recipe. Be sure to check the nutritional labels of the products you use, as some ranch dressings are higher in carbs than others. You can also make your own keto ranch dressing! I much prefer the taste, texture, and macronutrient breakdown of Greek yogurt chicken salad. As an ingredient, low carb greek yogurt adds more protein and less fat to this rotisserie chicken salad recipe than mayonnaise. It’ll also add a few more carbs to the equation — use whatever works best for you! 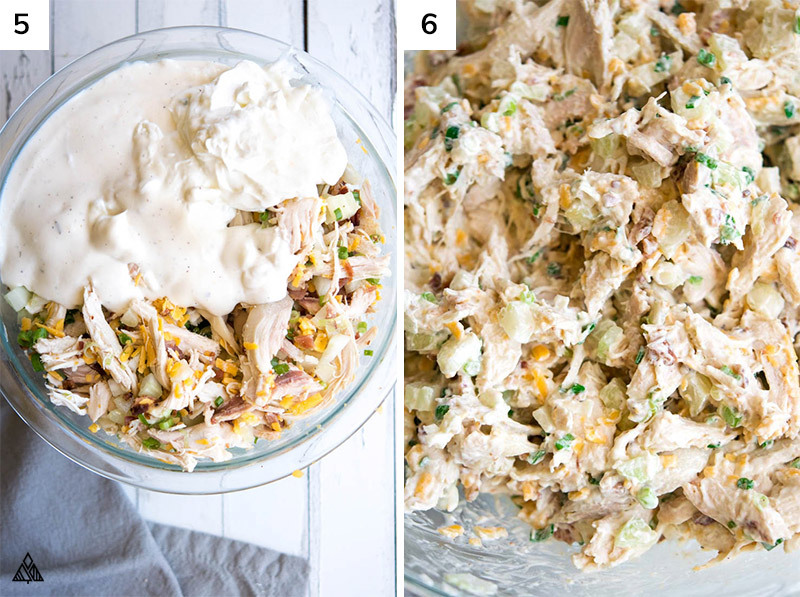 A delicious way to make this rotisserie chicken salad healthy – er, is to skip to mayo, greek yogurt and ranch dressing all together and mash up some avocados instead! Avocado chicken salad is every bit as creamy as the alternatives, although it tends to brown more easily, so eat it quickly! There you have it! Everything you need to know about how to make chicken salad at home, with a handful of tasty variations. Making low carb lettuce wraps! I suggest pre washing your lettuce (I find romaine works best) and packing that along with a container of this rotisserie chicken salad. Pre “wraps” don’t hold together very well! Stuffing your rotisserie chicken salad inside low carb vegetables. Depending on your carb count, tomatoes are delicious! As are bell peppers and hallowed cucumbers. Serving this with low carb crackers, or low carb tortilla chips. Make a rotisserie chicken salad sandwich, using a low carb bread recipe, or oopsie bread. low carb lunch meal prep! Aside from being super delicious, I love this rotisserie chicken salad because it makes for an easy low carb lunch to meal prep! I make a giant batch at the beginning of the week, and use one of the variations above each day. No dirty dishes to clean, and lunch is ready in minutes! Making it easy to stick to low carb goals, and enjoy what you eat. 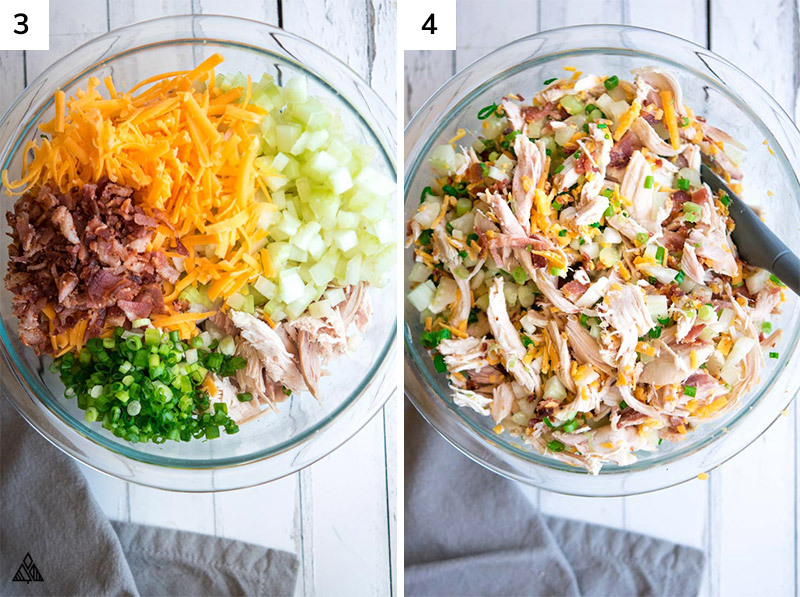 Without further ado, let’s get making this rotisserie chicken salad recipe! I hope you love it as much as I do, let me know what you think in the comments below! Did you try any of the variations? How do you eat low carb salads? Enjoy! 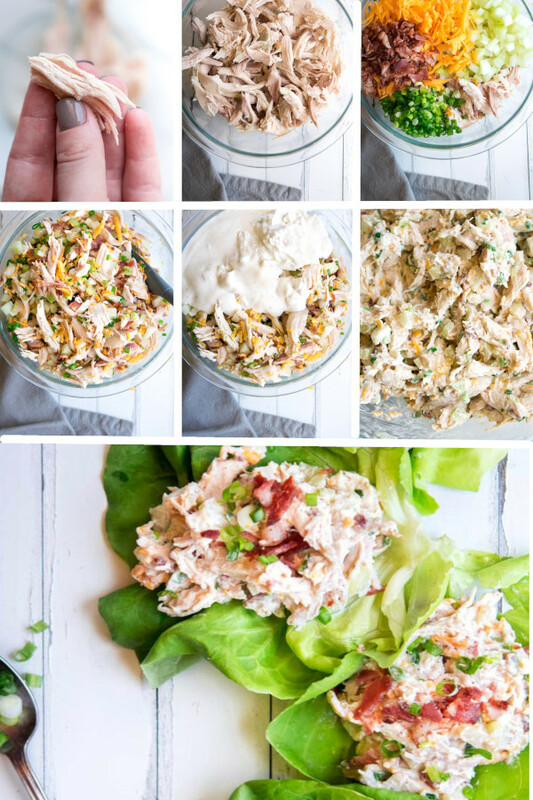 This rotisserie chicken salad is full of creamy, crunchy, cheddar-y, bacon-y goodness, mixed into a portable, protein packed low carb lunch! What more could you ask for? Chop, shred, cook and crumb ingredients above. In a small bowl, mix together ranch, salt, pepper and Greek yogurt. Pour ranch/yogurt combo into large bowl and stir until combined. To save carbs: Use mayonnaise, it’s lower in carbs that low carb Greek yogurt (but higher in fat and lower in protein). If using Greek yogurt, read labels. I stick to Fage, or Trader Joe’s brand as they’re often lowest in carbs and highest in protein. I find the best lettuce for lettuce wraps is Romaine, as it holds it's form best! Sounds delish! Try using smoked chicken for another twist. I serve a smoked chicken salad sandwich at my BBQ restaurant. Ohhh I LOVE that idea! Thanks for sharing!